The cornerstone for Christ Church Cathedral was laid in 1859, during a period marked by great popular interest in the Middle Ages. Tennyson wrote the Arthurian-themed Sir Lancelot and Idylls of the King. William Morris’ company began production of furnishings with medieval themes. Aristocratic British families had themselves painted in 14th- and 15th-century dress. The popularity of Gothic Revival architecture reflected a yearning for the spirituality associated with the early church. Rising Up! spoke to Julia Gersovitz, who is heading up the restoration of Christ Church Cathedral, to sound her out on the importance and appeal of the Cathedral’s architecture. RU: Are there many churches in Montreal in the same neo-Gothic style as Christ Church Cathedral? JG: There are lots of neo-Gothic churches, but Christ Church Cathedral is unique. Many of the landmark churches are designed according to neo-Gothic principles, but they follow different influences or aesthetics. For instance, St. Patrick’s is French neo-Gothic. English neo-Gothic architecture was promoted and controlled by a small group of thinkers, who understood that “the medium is the message”. They published extensively both in England and abroad and they were very much aware of what was happening in Canada. Frank Wills’ design for the Fredericton Cathedral, which is generally considered as a precedent for Christ Church, was criticized because the height of its transepts was not the same as that of the nave. RU: What features does Christ Church Cathedral have that make it architecturally special? JG: In addition to its simplicity and austerity, there is its size. It was conceived on the scale of a cathedral, and not that of a parish church scale. When it was built, it was the biggest Anglican church and one of the biggest churches of any denomination in town. Yet it’s beautifully proportioned. RU: What is your favourite aspect of the cathedral? JG: It has a sense of tranquility and spirituality that you notice when you enter. It’s quite a spiritual place. Whether you are Anglican or not, even if you are not Christian, you feel it. RU: What piqued your interest in this project? JG: Christ Church Cathedral is one of the monuments of Montreal. It is intrinsically connected to the city. Since its construction, it has been part of the life of the Square Mile and it continues to be a landmark. The inside of the cathedral tower has corroded over the years and needs urgent repair. RU: How urgent are the repairs to the tower? To the masonry? JG: The more we’ve worked on it, the more we’ve seen structural problems. The building needs serious attention and it needs it now. Deferred maintenance may be the order of the day in this society, but there is no more deferral on this issue. RU: What makes it worth preserving for future generations? JG: It’s a landmark. It speaks to the evolution of the area: the shift in the population that began in the middle of the 19th century as the middle-class exited Old Montreal, moving farther north, to the slopes of Mount Royal. It is important to the community, even to those who are not churchgoers. People know the building. It’s the place you refer to when you say, “I’ll meet you at. . .”. It is also magnificent—beautifully detailed and built. Why do people in Europe maintain and visit a medieval Gothic cathedral? Because they understand that it’s a work of art. But the Cathedral is also a working building, serving both its parishioners and the larger community. RU: What is the biggest challenge in the restoration project? JG: The underground shopping centre makes the placement of cranes and scaffolding a very delicate action. The stonework must be restored with care. Fortunately, there are workmen to do the job. We have wonderful craftsmen and great masons in Eastern Canada. RU: Why do you think Montrealers from many different backgrounds are supporting this campaign? JG: You don’t need to be Anglican to understand the value of the building. Value is generally judged by several factors. One is history. There is architectural value in its materials and stained glass windows. Context is important, too. Consider the open skyline and the green space in the back that is open to the public. The Cathedral’s spiritual value is also a community value, in that it is not only reserved for worship of Christian religion in Anglican tradition. It provides outreach to the wider community, in the form of a range of social services. It is there for everyone to enjoy. Christ Church Cathedral’s scale, location and spare neo-Gothic style immediately made it a Montreal landmark. Help us preserve this true historical work of art. 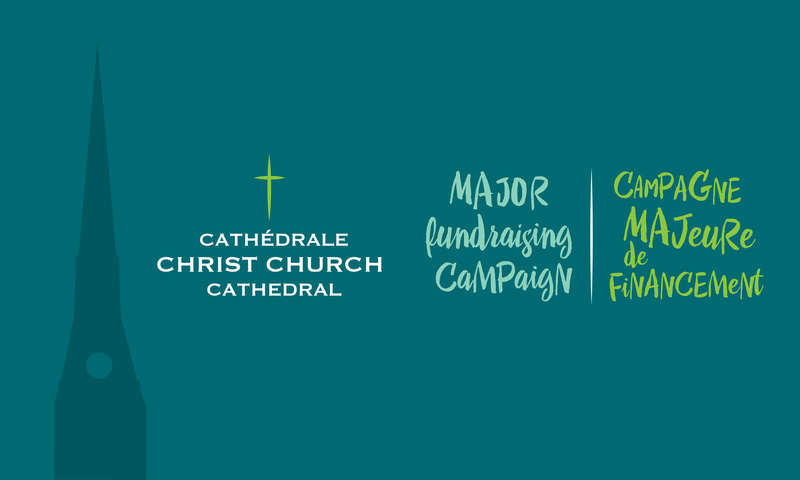 Of the funds raised by the campaign, $7,470,000 will go to repair the spire, restore the masonry and architectural elements, and upgrade the church interior. Please consider building the future through this gift to the coming generations. Click here and donate what you can. Big or small, every donation counts! The name Julia Gersovitz is one familiar to many Montrealers, as she has carved out a reputation for herself as a national leader in the field of conservation and rehabilitation of historic buildings. She began her career in conservation when the discipline was still undeveloped in Canada. A founding partner of EVOQ Architecture, she leads the firm’s large-scale heritage projects. These have included St. George’s Anglican Church, St. Patrick’s Basilica, McGill University’s Arts Building, Rideau Hall, the West Block of Parliament, and now Christ Church Cathedral. In addition to her practice, Julia has been an adjunct professor at McGill University School of Architecture since 1980, teaching conservation and history courses at both the undergraduate and graduate levels. She continues to be a visiting professor in Canada and abroad. Julia has also served as a member of numerous design review commissions, at both the provincial and municipal levels. Her community engagement has included directorships on the boards of various not-for-profit organizations, including Heritage Montreal. At 2 p.m. Viktor Lazarov presents Rhythms and colours of the Balkans, his most recent recital featuring works by contemporary and early 20th century Serbian and Serbian Canadian composers. At 4 p.m. Patrick Wedd performs the second of a series of six concerts with organ music by Johann Sebastian Bach. These 1-hour concerts take place the first Saturday of each month from up to the month of June. On Sunday, February 4th, lawyer Catherine Fagan, who practises in the areas of Aboriginal, constitutional and environmental law, will be speaking at the Cathedral after the 10:00 a.m. service. Me Fagan was invited to speak by the Social Justice Action Group, as a follow up to its work on Call 62, one of the 94 calls to action published by the Truth and Reconciliation Commission. Stay tuned for more information on SJAG’s work in this regard in next week’s blog post!